221 p. ; 22 cm. Few know the story of the Japanese invasion of Alaska during World War II - until now. Ghosts in the Fog is the first narrative nonfiction book for young adults to tell the riveting story of how the Japanese invaded and occupied the Aleutian Islands in Alaska during World War II. This fascinating little-known piece of American history is told from the point of view of the American civilians who were captured and taken prisoner, along with the American and Japanese soldiers who fought in one of the bloodiest battles of hand-to-hand combat during the war. Complete with more than eighty photographs throughout and first person accounts of this extraordinary event, Ghosts in the Fog is sure to become a must-read for anyone interested in World War II and a perfect tie-in for the 70th anniversary of the bombing of Pearl Harbor. 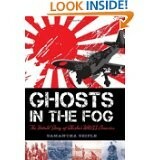 Ghosts in the fog : the untold story of Alaska&apos;s WWII invasion / by Samantha Seiple. World War, 1939-1945--Campaigns--Alaska--Aleutian Islands--Juvenile literature. World War, 1939-1945--Alaska--Aleutian Islands--Juvenile literature. 100 ME:PersonalName 1 $a Personal name Seiple, Samantha. $c Statement of responsibility by Samantha Seiple. 263 ProjectdPublish $a Projected publication date 1110. 505 ContentsNote 0 $a Formatted contents note Preface: The Forgotten -- The Secret in the Dungeon -- Invasion of the Ghost Warriors -- The Rising Storm -- Escape and Burn -- Dead Man Walking -- Fighters, Bombers, and Cutthroats -- The Last Banzai -- The Surprise Attack -- Ghost Towns -- The Prisoners -- Afterword: The Remembered. 610 Subj:CorpName 10 $a Corporate name Japan.